It has been quite a while since I sat down to write. My father’s passing, his funeral, and the aftermath of his death have been at the forefront of my time and thoughts. It has been a time of both grief and reflection. During this time it has felt very much as if the ink in my pen has been crystalized, and it is only now that sorrow and tears are beginning to blend with that up-till-now dried ink-well of my imagination to once again let the pen flow. First, I feel it is necessary to eulogize my father’s passing to the broader Ukrainian community in Australia, to whom he dedicated the vast proportion of his adult life. My father gave himself selflessly to the Ukrainian Catholic Church, and to the dream and hope of a free Church in a free Ukrainian nation. Vladimir Roman KANIA was born on the 21st of June, 1927, in the borough of Jaroslav, an ancient city on the Sian River, Galicia, Western Ukraine (now Poland), into the respected burghers family of Ivan (Jan) Jakob and Franciska Kania. From a very young boy Vladimir’s life revolved around the pro-Cathedral of the Transfiguration of Our Lord in Jaroslav. Fr. Stefan Hrynyveckij and Fr. Joseph Kyshakevych taught Vladimir church singing. Fr. Charles Hasko, collected Vladimir at 7.00 a.m. every morning for the Divine Liturgy and lessons in the Church Law; Fr. Stanislaw (Eustachij) Federovych, Vladimir’s great uncle, taught him: Catechism, Rubrics and the History of the Eastern and Western Churches. In August of the same year Fr. S. Hrynyveckij (Deacon of the Pro-Cathedral) presented Vladimir to his Excellency Bishop Hryhorij Lakota in the Cathedral of St. John the Baptist in Peremyshl and he was accepted to the seminary. However this was against the will of Vladimir’s father and he was subsequently sent to work. In 1936 Vladimir became a member of the Ukrainian Youth for Christ; in 1937, a member of ‘Sokol’, and in 1938 he learnt Ukrainian Dancing from Vasyl Avramenko’s instructors. Vladimir completed his high-schooling in 1943. In August of the same year Fr. S. Hrynyveckij (Deacon of the Pro-Cathedral) presented Vladimir to his Excellency Bishop Hryhorij Lakota in the Cathedral of St. John the Baptist in Peremyshl and he was accepted to the seminary. However this was against the will of Vladimir’s father and he was subsequently sent to work. On Sunday the 23rd of July, 1944, Vladimir, his parents, and one sister fled Jaroslav to Dresden and in October 1944 they received permission to settle in Sudetenland, Sumava, (now Czechia), where he was employed as an assistant gardener in Kaplice. In February 1945 Vladimir went to Lower Silesia to collect his youngest sister for reunification with the family. Vladimir and his sister were subsequently survivors of the 13th – 14th February destruction of Dresden. After the end of World War II Vladimir worked with the US Army translating and interpreting for the large influx of Displaced Persons escaping from the Russian Zone and with the Czech Local Government interpreting in the District Court in Kaplice, Sumava. 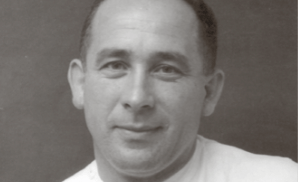 When the occupying forces left Czechia in November 1945, he became a member of the Czech ‘Sokol’ as a physical instructor preparing athletes for the Prague Slavonic Games in 1948, and represented the Czech Youth as the delegate at the Youth Congress in Karlsbad (Karlovy Vary) in 1947. On the 25th of February, 1948, the day of the Putsch (Coup) Communists arrested Vladimir on the grounds of agitation against Klement Gottwald (the Communist usurper) and he was detained. On the 25th of February, 1948, the day of the Putsch (Coup) Communists arrested Vladimir on the grounds of agitation against Klement Gottwald (the Communist usurper) and he was detained. After a few weeks he was released and travelled to Rosbach, North Czechia. At the Ukrainian Easter celebrations, in Sunday the 18th of April, 1948, he met His Excellency Bishop Pavlo Gojdych who advised Vladimir to leave Czechia for studies abroad and with a letter of reference from Bishop Gojdych, he left Czechia for Rome. This was done on the proviso that Vladimir, having been drafted into the Czech Army, would return to Czechia to do his military service. He was met in Rome by Fr. Dr. I van Prashko (later Bishop Prashko), and accepted by Bishop Ivan Buczko into the Seminary of St. Josaphat in Gian Nicolo de Tolentino, Rome. It was not long after that his mother and sisters arrived in Rome from Czechia and Vladimir was transferred to be assistant to the parish priest Fr. Julijan Nebesyj and later Fr. Omelijan Nakonecznyj in Bagnoli, Italy. Revd. Dr. I Prashko later asked Vladimir’s mother for him to return to his studies but his mother requested that, as he was her only son and support, he travel with the family to Australia. He was met in Rome by Fr. Dr. I van Prashko (later Bishop Prashko), and accepted by Bishop Ivan Buczko into the Seminary of St. Josaphat in Gian Nicolo de Tolentino, Rome. The family arrived on the 23rd of April, 1950 in Newcastle on board the Amarpurra and transferred to Greta Migrants Camp where Vladimir busied himself with organising the “Krylos”. On January the 8th, 1951, Vladimir and two of his sisters arrived in Western Australia for reunification with the entire family. He worked as a cinematographer and later as assistant in pharmaceuticals at FH Fauldings. He was a member of the St. John Ambulance for a few years; participated in the Victoria League 50th Jubilee; served in the Australian Army (Reserves) 7/13 (later changed to the 7th Field Ambulance Pan Tropic Division) till 1962; graduated with credit as a registered nurse in 1962; senior sister for seven years; appointed Welfare Office in Orthopaedic Department, Royal Perth Hospital (RPH) and Royal Perth Rehabilitation Hospital (RPRH) in the Medical Social Work Department; (where he stayed until his retirement), was a member of the Darwin Relief Committee (Cyclone Tracey); member of the Migrants Emergency Fund; Professional Member of the Good Neighbour Council of Western Australia for many years (later known as the Ethnic Affairs Council); Foundation Member of the Institute of Interpreters and Translators; Foundation Member of the Australian Institute of Welfare Officers; member for a time of the Croatian church choir of St. Anne’s, North Fremantle; delegate to the 13th Citizenship Convention in Canberra, 1962, representing non-British migrants; graduated 1st in the Deutsch-Australischen Sprachvereins State Exams in German Studies; on 14th of March, 1979 appointed as a Commissioner for Declarations, and was an avid historian. From 1952 until 2015, he was the cantor for the Ukrainian Catholic Church. From 1952 until 2015, he was the cantor for the Ukrainian Catholic Church. He was a choreographer from the 1950’s of Ukrainian National Dance until the early 1980’s. He was President of SUM (Ukrainian Youth Association), for 16 years; taught Ukrainian Language from 1951 – 1953 in the Beechboro, Bassendean and Bellevue areas; taught dancing in the Melville area, was a member of the Ukrainian Church and Association Choirs and the then Ukrainian Melville Choir. Vladimir was the editor of the Church Newsletter Cerkovni Visti for over 20 years and the author of the two volume book: Propamjatna Knyha, The History of the Ukrainian Catholic Church in Western Australia (1947 – 2002). He wrote many articles for the Australian Press, and is the author of A Short History of the Balkan Nations – an handbook for Medical and Associated Health Workers in RPH, as well as other historical and religious papers in Ukrainian and English. In the last month of my father’s life, I spent all but two days visiting him in the hospital. There were times when I thought he may recover, as best a ninety year old man can, but an infection that he picked up in the hospital led to pneumonia, and after this, his decline was speedy. I was able to sit beside him and read his favourite poems, and sing to him his favourite hymns and folk songs. I stroked his forehead one evening, and he opened his eyes and said: “Nice”. I spoke to him about my travels through Germany with my young family in 2008, and his eyes opened and sparkled, he propped himself to one side, and listened intently, commenting on the various places that I mentioned. He laughed when I told him about getting lost driving through the Black Forest one evening. In the very last days I sang to him from Telemann, and read Goethe’s Erlkonig. One day when I came to the hospital after work I could hear him from the end of the hospital corridor reciting Heinrich Heine and Schiller. My father had a phenomenal intellect – fluent in 12 languages. His strongest languages were: Ukrainian, Polish, German, English and Serbo-Croatian – probably in that order. As his illness progressed he spoke less English and more Ukrainian and German. He laughed so hard when two days before he died I told him an old joke from the movie Becket. Outside of his home in Perth, the city he loved the most was Canterbury in Kent. My father had a phenomenal intellect – fluent in 12 languages. His strongest languages were: Ukrainian, Polish, German, English and Serbo-Croatian – probably in that order. There were many things that I loved about my father; one of which was that he was a true intellectual. There was no subject that he would not engage with someone, if they so desired. I miss this so much. Perhaps today I would like to speak about Franz Josef, or talk about Matthew Flinders, or the Treaty of Waitangi, or Karl XII. On every subject, even the most esoteric, he would sit and discuss. I have many friends who discuss certain elements of these subjects, but many more also whose eyes would glaze over, if the subject did not suit them. My father wanted to know. He never seemed to be disinterested or tire in a conversation that was one based on: history, politics, or religion. His favourite topics of discussion were those we are warned not to discuss in public or at social forums. Another aspect I loved about my father was his deep – fervent Catholic Faith. To his very last breath he prayed. More than anything he was loyal to his Ukrainian Church. He was a liturgist – and the Church Calendar defined his life. He had an outstanding tenor voice; and knew by rote the entire liturgical texts of the year. He had been taught well by the priests of his youth. He never forgot these men, and he never ever spoke about them without prefixing their names as, The Reverend Fr. Hasko, or Reverend Father Kyshakevych. All of his priestly mentors were murdered or suffered terribly for their Faith. My father outlived these men by well over half a century – but their memories were ever present and alive to him. Even in their death they were still his teachers and mentors. I am sure that they are all rejoicing together in Paradise, as I write. There were many things that I loved about my father; one of which was that he was a true intellectual. There was no subject that he would not engage with someone, if they so desired. The day before he died my father held my hand so tightly for five minutes and looked into my eyes. We were alone together. He held my hand so strongly – with the strength of a man, many years younger. He kept looking into my eyes. He didn’t say a word. I sat with him for a little while longer, sang a few more songs – and then told him I would see him tomorrow. I told him I loved him, walked out of the room, and began walking down the hallway. I walked perhaps fifteen paces, when a voice said to me – “Go back Andrew, and give your father another kiss.” I walked back to his room, he was lying to one side looking out of his window; the setting sun was now mingling with the light of the street lamps. I placed my hand on his head, and kissed him on the forehead. I told him again that I loved him. I walked out again, and looked back. He was rubbing his hands together. The next time I saw him, less than a day later, was when the parish priest of St. Joseph Pignatelli Parish in Attadale, Fr. Sean Fernandez, (who had been his regular Confessor in my father’s years of debilitation), was anointing his lifeless body. Fr. Ihor Holovko, came also to say prayers at the hospital. I count myself as having been very fortunate to having had a father such as mine. He was always loyal to my mother, and would always defend his children. He taught me about commitment and Faith. If he said something was this way – it was. He was of the old world and of its values. He believed in the respect of elders, and that you never joked about God or Church. He died like a man. He was in great pain in his final days, but always tried to engage with his family. I miss him immensely – not only because he was my father, but that he was a man, unlike modern men. My father was buried, as he wished, in the Tradition of the Ukrainian Catholic Church on the 27th of October, 2017. My father would not have reached the age he did without the love and constant care of his wife of 53 years, Kathleen, my mother. Her love for my father was the epitome of the Noble Wife from the Book of Proverbs. I feel unequivocally that the Ukrainian Catholic Church owes my father a deep debt of gratitude, and will perhaps only come to understand the degree of this debt, in the years that are to come. This article was published in The Church and Life Newspaper, October 2018.